Non-underwired triangle bra. Lace cups, tulle back. Small bow between the cups.86% polyamide, 14% elastane. Lightweight down jacket. Lightweight and warm with its natural down and feather padding.Details Fully padded. Front zip. 2 side pockets. Length 72cm approx.Fabric Lightweight down jacket, 100% polyamide. Padding, 90% down, 10% feathers. Tights and socks will add a touch of personality to any outfit. Add a pop of colour to your outfit with a pair of frilly ankle socks worn with sandals for an alternative, next-season-now look. Opt for knee high socks worn with a pretty day dress for a feminine look, or work 60s-inspired white tights with an a-line skirt to take your style to new heights. Breathe life into your new season layering with the latest coats and jackets from boohoo. Supersize your silhouette in a quilted jacket, stick to sporty styling with a bomber, or protect yourself from the elements in a plastic raincoat. For a more luxe layering piece, faux fur coats come in fondant shades and longline duster coats give your look an androgynous edge. A brand new style for us, our new favourite coat is clean-cut with a tailored fit and a British herringbone by Abraham Moon & Sons. Smart enough for work or stylish play. Under Armour compression baselayer shorts. Armani Jeans extra slim short sleeve tee. Crisp, smart and comfortable. Each Joseph Turner men’s formal shirt is tailored with meticulous attention to detail, using the finest pure 2/100s two-fold cotton. 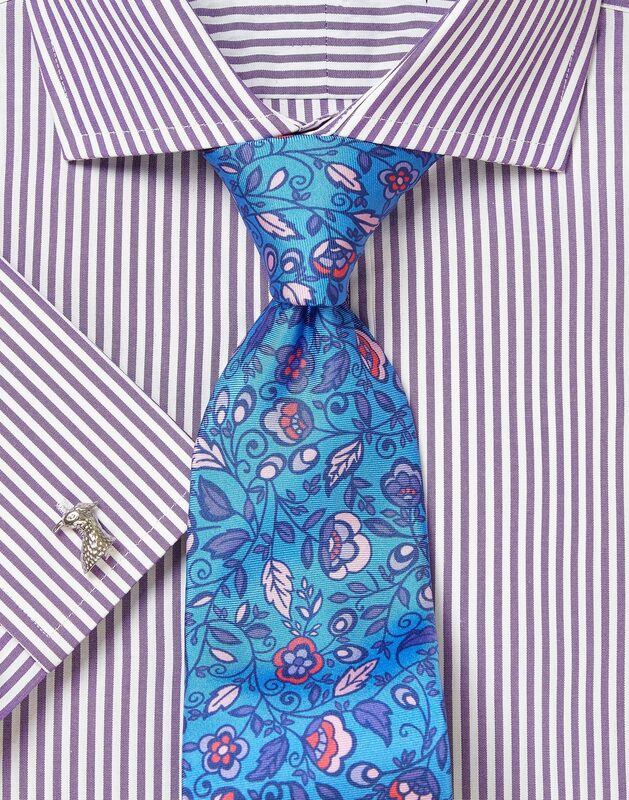 This Purple Bengal Cutaway Collar men’s formal shirt looks great teamed with one of our pure silk ties.